When you’re labeling the pipes in your facility, you want to make a pipe’s contents as clear to viewers as possible. Achieving this involves selecting the appropriate size, color and location for your pipe labels. 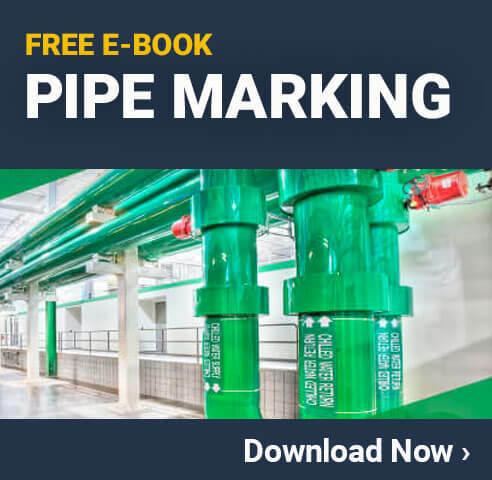 By using the guidelines established by the ANSI/ASME 13.1 standard, you can create a pipe marking system that is easy for workers, maintenance personnel and emergency responders to understand. What should you do, though, when the text you need to fit on your pipe marking label is too long? Can you shorten it without diluting the meaning of your label and confusing your workers? In many cases, you can make your pipe label long enough to fit all the text you need. Sometimes, though, the length of pipe will not permit this. You might also need to use abbreviated text if you’re labeling pipe valves with valve tags, as these tags are usually small. There’s one other consideration you should make when you’re deciding what text to put on a pipe label, and that’s the required size of the text itself. You can’t just use a smaller font size and then cram all of your text onto the label. The size of a label’s text depends on the size of the label, which is determined by the size of the pipe you’re dealing with. In this example, you are working with a pretty large label, so abbreviated text might not be necessary. If the contents of this pipe required a lengthy description, though, it would be permissible to use recognizable abbreviations. If you run a large facility with many pipes, it’s often easier and more cost effective to print pipe marking labels yourself using an industrial label printer. A printer allows you to make labels whenever you need them and it allows you to easily customize the text on your labels, which is helpful if you need to make a lot of pipe marking labels with abbreviated text. If you do make labels yourself, make sure you abbreviate the text on them consistently. Just as you want your pipe marking system’s color scheme to be consistent, you’ll also want the text on your labels to be uniform and easy to understand. To learn more about the basics of pipe marking, read this guide or take a look at the infographic below.